How can managed network services can provide a strategic advantage for your business? Managed network services provide access anywhere, greater stability and proactive maintenance and support. Your mobile workforce has access to business resources from anywhere, anytime, often with any device. This makes your road warriors or remote service teams more efficient and more responsive for other employees and your customers. Your company also gains stability provided by managed services that often exceeds the level you could provide internally without incurring significant cost. In addition to stability and versatility, network support teams monitor for degraded performance or problem issues. They can often resolve problems before impact to your business occurs. As with any technology, there can occasionally be unexpected issues generated by hardware failures, connectivity problems, or simply users who need help with access. When problems rear their heads, who do you contact, and will they be available? If you reach a support contact, will they be responsive and be able to resolve your problem? 24/7 network support is what makes one managed service provider stand out from the rest. Where Do You Call for 24/7 Managed Network Support? Whether you’re running an enterprise help desk, or you’re a sales representative trying to enter an order for an important customer, when you need support, you need access that can help resolve your problem quickly and efficiently. Phone contact – Your users must have access to that phone number, or you may choose to implement an IT service desk for centralized call management, with the service desk making the contact to your provider. Email – Less urgent issues may be resolved through email to network support resources or directly to the managed services contact. Online chat – One of the best customer experiences is immediate access to a contact who is trained to troubleshoot most common issues. This resource can also escalate problems to a higher-level technician, as needed. Of course, online chat and email are of little use when the problem is truly a connectivity issue, rendering those modes of communication ineffective. All employees, customers, or users who are authorized to make a support call have the number readily available, along with any identification or credentials required to validate their authority for the call. Your provider has documented service level agreements (SLAs) that define how calls are to be handled, along with priority and anticipated time to resolution. There are agreements with the managed service regarding your 24/7 service expectation, including whether your call will go to a service desk that logs the incident, or if you will be connected to a technical resource prepared to react to your issue. Having your support requirements documented and understood by your managed service provider and your business associates will ensure effective resolution to your network support issues. Many managed services providers have implemented sophisticated network management tools that provide real-time monitoring for their support teams. This allows them to detect outages and situations that may lead to problems if not addressed promptly. Access to support personnel trained to assist with connectivity problems around the clock. No worries about different time zones, or employees and customers in different countries. Technology increasingly runs the business world, making 24/7 support critical for your internet-connected applications. If your customers cannot access your website, they may try a different supplier. Reliability provided by managed network services gives you a business advantage. Responsive support keeps your business running smoothly and your operations more efficient. Managed services provide a cost-effective alternative to hiring, training, and retaining in-house personnel for such functions. Total cost of ownership (TCO) can be much lower through utilizing a managed network service including 24/7 support as opposed to establishing, maintaining, and supporting in-house infrastructure and IT resources. 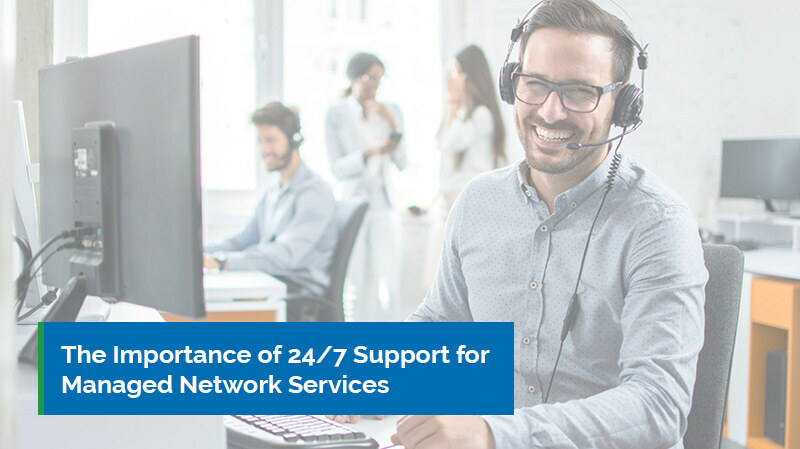 Enlisting the services of a managed network service provider goes a long way toward providing your business with 24/7 network support. Most provide a rosy picture of their service excellence and around-the-clock availability. When selecting your managed service, be certain to verify their service history with customer references and even online comments by existing or past clients (never taking online comments as gospel, of course). Donnellon McCarthy consultants offer the 24/7 network support your growing business needs. Contact us for an in-depth review of your managed services and support requirements.